We had hoped that the sprouts would get a little bigger on the stalks, but we were late planting by a few weeks. Still, better than none at all. We’re finished for this winter. You’ll get a voucher for the last winter week good towards a 2014 CSA share, or for purchasing our produce at farmers markets. 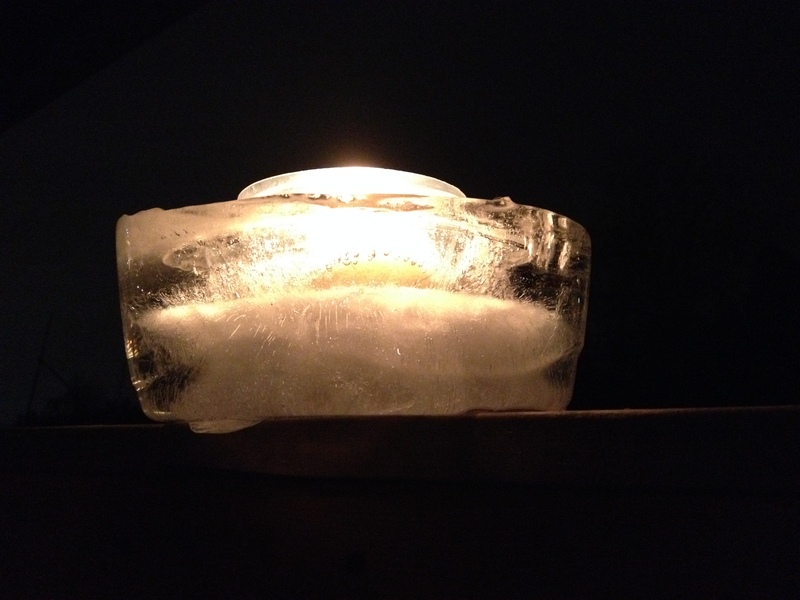 We made lanterns out of ice, lit with a candle, to celebrate our new farming year. Happy New Year! 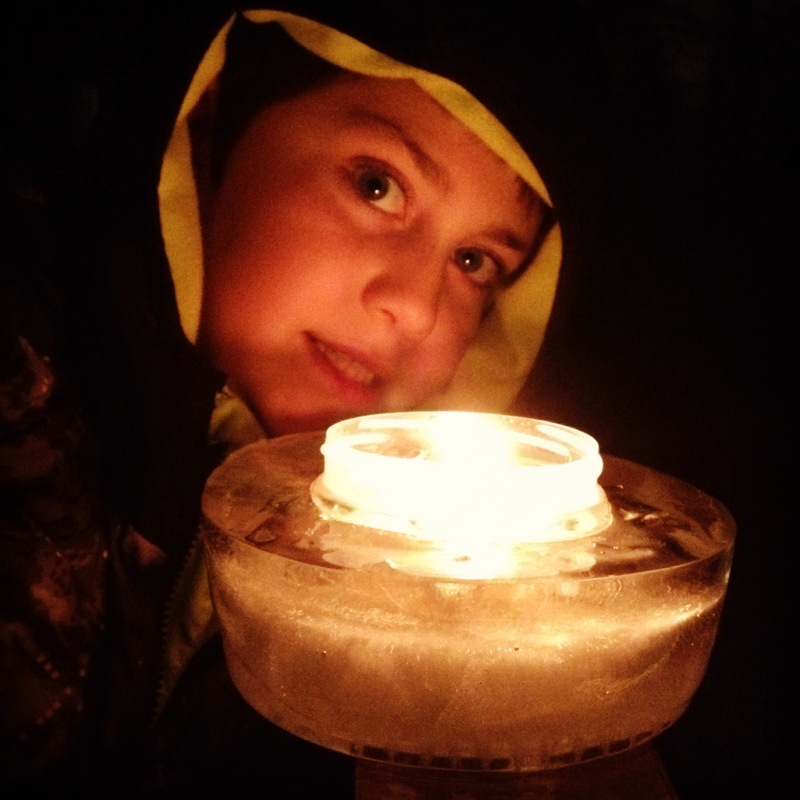 We celebrated the Winter Solstice by playing with a globe and making ice lanterns. Then we had cocoa and lit the lanterns in the darkest part of night on December 21st. Farming New Year’s Eve. I woke up on the morning of the 22nd ready to start the new season, Mike decorated our booth at both farmers’ markets and we won the Solstice Decorating Contest on Sunday. What a great way to begin the new year! We’ve decided to call the year finished now, with a double load of everything we have left in the field still worth picking. We have plenty of carrots, mostly, but the greens and beets were hit hard by freezing. 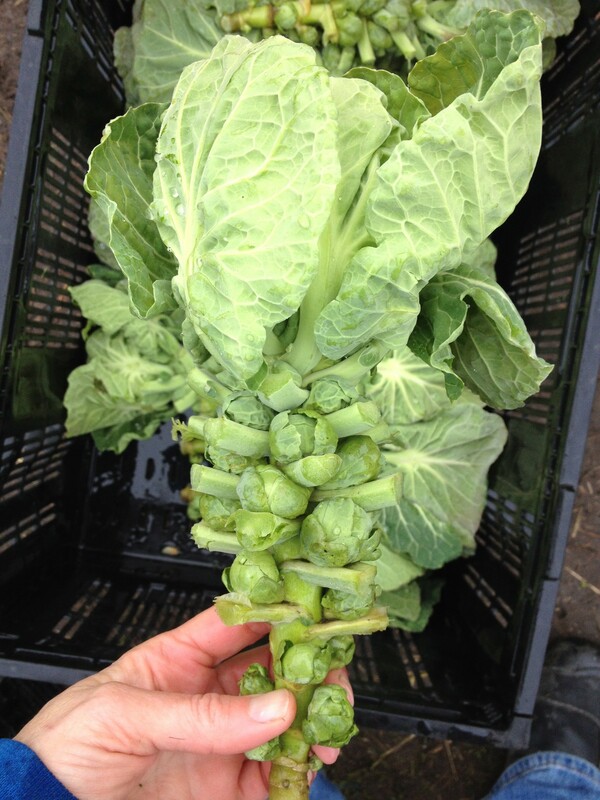 Although there are lots of crops left alive in the field, most are not worth picking, aside from cabbage and Brussels sprouts, and cabbage. The potatoes and squashes are still saved from earlier harvest but are running out, so we’re distributing what are left of those as well. We believe we can serve you all better with a credit for the remaining one week, so that will come in an email next week. 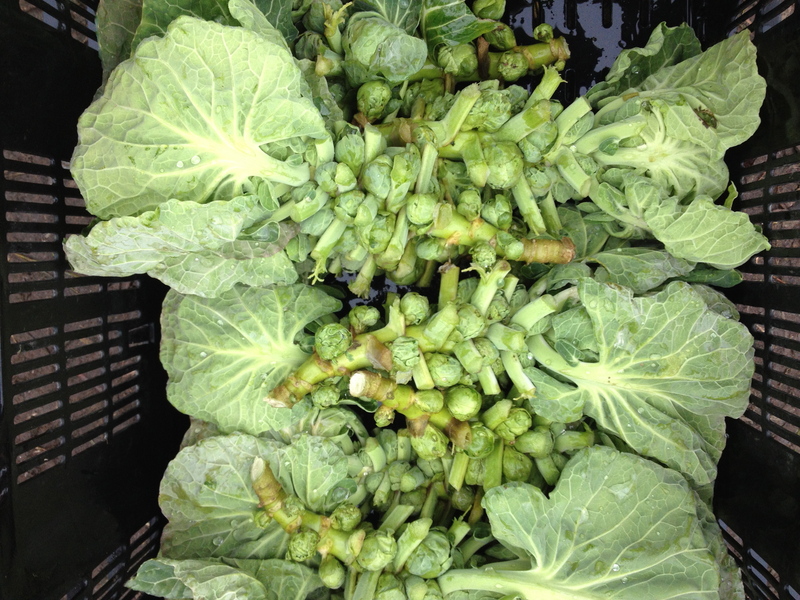 You can eat the fluffy tops of the Brussels sprout stalk, too. Tasty and sweet, just like kale or collards. As we usually do at the crux of a new season, we are full of ideas. New things to try, things to improve, hopes for the new year. At the top of my list this year is another big greenhouse, with doors for all the greenhouses instead of flapping plastic sheets. I know I want to improve the u-pick area for CSA members, and somehow we need to improve our pick-up area so it doesn’t get so crowded. I’m working on the new CSA flyers, so look for those in your mail and email, as well as your credit voucher for the missing winter week. Now that the holidays are past, we are trying to find our homeschool rhythm again. It’s so hard to find that tempo after almost a month of going with the flow. It will come again, and so will the rhythm of farming. Refining the planting schedule, repairing machines that broke, trying new varieties. And then, the beginning of actual planting—only a few weeks away. We hope you have a peaceful winter, and we hope to see you again in the spring and summer for another bountiful harvest. Thank you for being there with us through the last amazing year. Thanks you for an amazing year. We feel very lucky to be able to be CSA members enjoying the bounty of your harvest. It is reassuring to know that the food we eat is healthy as well as tasty. Over the years we have tried many foods that we wouldn’t have been exposed to at our local super market. We sing your praises to anyone willing to listen.